Jordan Bingham here. I am so sorry to be late. You see, Uncle Kev had an unsupervised and unexpected experiment that involved a light switch and a pail of water. The results were quite dramatic. Now that we have power again at Van Alst House, I am able to post here at Killer Characters, a place I love to visit. Please attribute any typos to residual nerves. So yes, it was a long eighteen hours, but the fried wires have been replaced and frayed tempers are somewhat soothed by a late but substantial breakfast (towers of pancakes, fresh local maple syrup, bacon and sausage) out of Signora Panetone’s kitchen. We have been promised Tuscan Chicken on Bread for dinner. All to say, at last I can tell you about how much I enjoy my life here, with my third floor attic quarters and the great meals that are also part of my compensation. It is the best job in the world: finding first editions to maintain and upgrade Vera Van Alst’s amazing collection of fine firsts from the Golden Age of Detection. I love being surrounded by these books, even though they seem to attract danger and even murder from time to time. I have adjusted to Vera’s cantankerous ways, the Signora’s commands to “Eat! Yes!” and the Siamese. 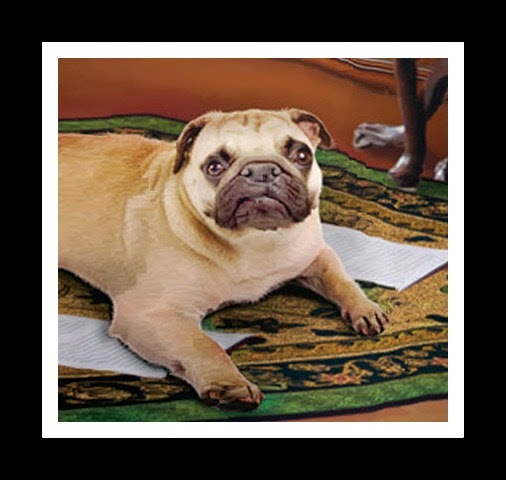 Walter the Pug is always welcome on the premises. That reminds me: what do you think of the cover of our forthcoming book collector mystery? 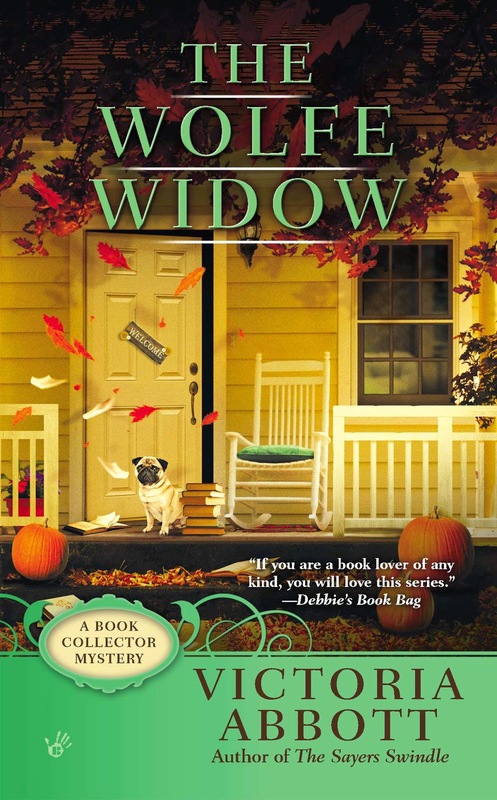 The Wolfe Widow will be out September 2, 2014. I can’t wait to find out if we all live or die. But such is the lifestyle of a character. Tell her you love the pug! Thanks, Willow. Of course, Jordan is out of commision again, but I'll pass on your comment. Interesting indeed! Glad you're okay and able to eat such great meals, Jordan. I do like the cover--especially the picture of Walter. Thanks, Linda O. Jordan can't access her computer right now (thanks Uncle Kev), but I'll pass on your greeting. Walter will also be pleased. He is hiding under a bed right now. Falling leaves, flying pages, and Walter. Looks pretty good to me! I eagerly look forward to this next installment. Thank you, Libby! We are all very excited, including Jordan who is offline right now. Something to do with power outage.